A few weeks ago in church our pastor spoke about Proverbs 18. The sermon was geared towards the father and men at church since it was Father's day but I found myself applying it to my own life. One of my biggest struggles in life as a woman, wife, mom, and friend is fear and anxiety....the "what ifs" can sometimes cloud my thoughts and before I know it I am all worried and anxious about something that isn't even happening! I know you have been there before too, we all have! Women are so interconnected to EVERYTHING so we tend to worry about EVERYTHING. In Proverbs 18, it talks about how David is needing to be rescued from his enemies and how he needs God to save him. Read the verses below...He is our ROCK, our SALVATION, our SHIELD when we need safety. He is everything I need, you need, especially when we begin to worry and fear! So I want to encourage you today, to find safety in Him. 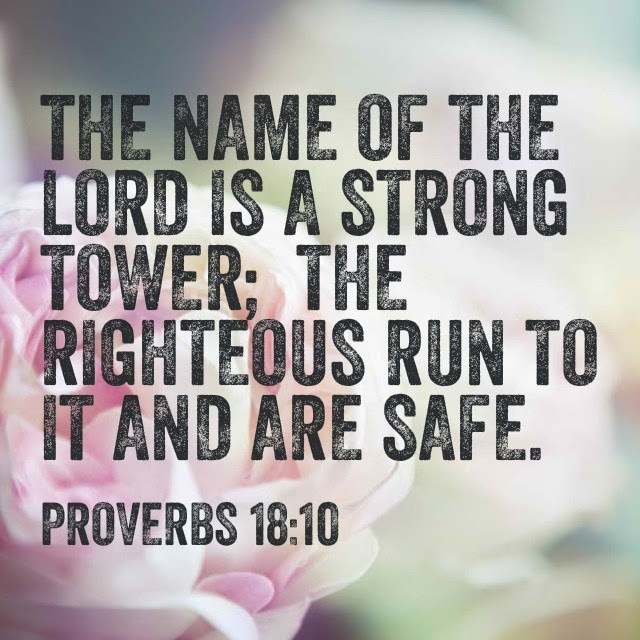 He is your strong tower and He will help you in your time of trouble and despair and even in your "everyday" worries and fears! Also, check out Proverbs 31 ministries online, they have an amazing daily devotional email geared towards women. LOVE IT!